Lava Lake Resort is located on Lava Lake, which was formed as a result of lava flows creating a dam along the lake’s eastern shoreline. The resort is about 40 miles southwest of Bend and is open mid-April to late October, weather permitting. Visitors and campers are advised to check the website for current dates of operation before venturing out. Lava Lake allows motorized boats that must adhere to a 10 mph speed limit. The area is very popular with hikers, bikers, fishermen, and those just wanting to enjoy a cool, tranquil lake on a hot summer day. Fish species indigenous to Lava Lake were bull trout, redband trout and whitefish, but the current fish population is composed of introduced brook and rainbow trout, whitefish, and illegally introduced tui chub. 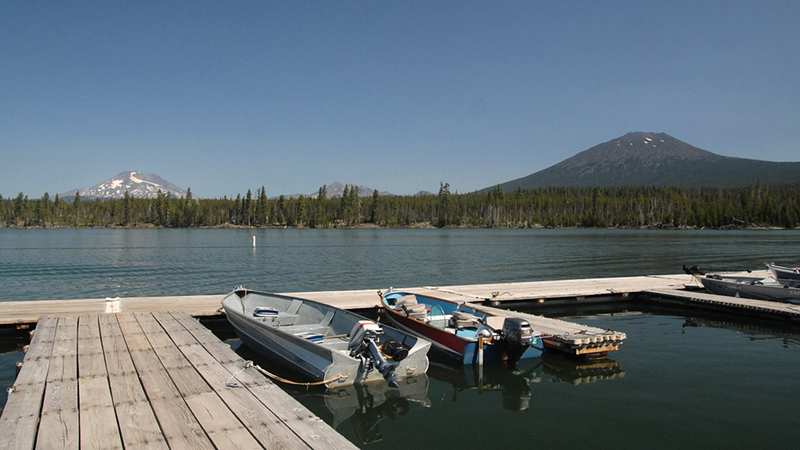 Lava Lake Resort Marina features boat rentals, and RV park with full hookups, gas and oil, showers, and laundry. There is no lodging but tree-lined camp sites are available. There is also no food service but an on-site store stocks camping essentials and groceries, so you can likely avoid a trip back to town if you forget something.